Why Should They Look at You? Visibility is the prime aspect of any campaign and the one, which lacks it, is destined to doom from the start. Personalized magnets 5.5 x7 helps you to answer the basic question why should they look at you. It is big and allows you to get creative to the core. Remember one thing that you would find this size only at the eCommerce store stocking made in USA magnets. They would also offer you benefits of free full color printing, which means you can go lavish with choice of colors. This creative support always helps marketers to go lavish with their choice of market information. They can create distinct and attractive campaigns from many of their competitors. Many may argue that marketing is all about fluff, fluff and fluff. However, a part of it is true because marketing is an art of attracting customers to buy the product. What would happen, if fluff goes for a toss and marketers start concentrating on real facts? They can utilize such large magnet for printing sales flyers, rack cards, and other promotional materials, which offer ample information about their business without giving any fluff. Why Should They Advocate You? Over the years, marketing pundits and people have fiercely debated on the question, what makes a successful marketer? They have always drawn up with conclusions that a successful marketer is the one who shared good vibe with their customers. Today, businesses understand how referral marketing and word of the mouth marketing helps them to create value for their business. They can easily create a favorable atmosphere for their brand by distributing customized 5.5 x7 magnets printed with specials reward programs or savings or discounts. This gesture will obviously create 100’s of brand ambassador with one time investment. Customers would easily appreciate full color promotional magnets offering them umpteen value savings for their earlier purchases or reward points. Perhaps they would be encouraged to share the details with their family, friends, colleagues and everyone else. You can employ these customized magnets to print discount coupons, savings coupons or reward coupons depending on the choice. Why Should They Remember You? 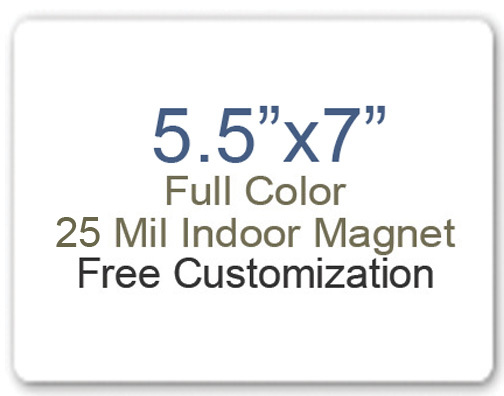 Customized 5.5 x7 magnets printed with real information, value information and special information would make great brand reminders, and people would retain them over their refrigerator doors forever. You can gift away 5.5×7 magnets printed with holiday wishes, greetings, savings information, and others during the next trade show or promotional event. You can perhaps find out many other ways of campaign optimization by indulging customized 7x 5.5 magnets.